I’ve spent the last few weeks making costumes for the local Musical Society. I do love making stage costumes. Demi-character costumes are a lovely mix of stagewear and dancewear. The character has to be self-evident but it cannot overshadow the choreography or the dancer. This costume is meant to evoke the feeling of poor mistreated Cosette before Jean Valjean rescues her from the Thenardiers. 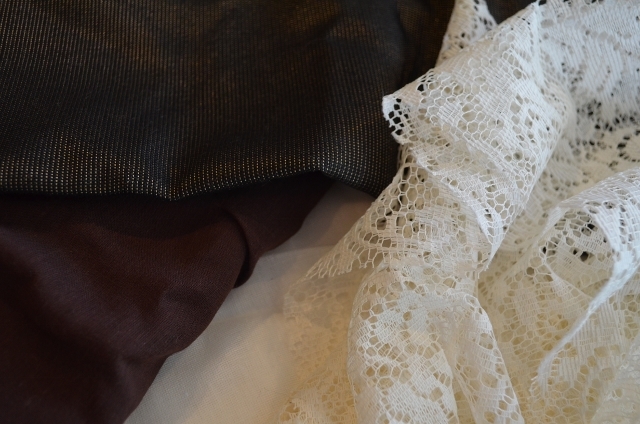 We chose dark browns for the bodice and the skirt and ivory for the chemise and petticoat. 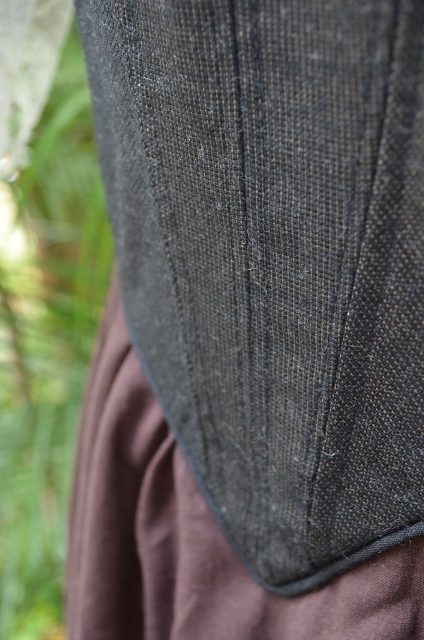 The bodice fabric has a light gold thread through it. It gives no sparkle but from gives a little texture to an otherwise flat colour. The skirt fabric is just broadcloth. This bodice joins at the shoulder and allows a faux chemise and sleeve to be easily added. They could be removed to give the costume a different look. I don’t like ragged hems to just be cut into triangles or dags. I try to make them look like they have been made ragged through wear. Scissors are my first attack, then I rub the fabric together and then run it underfoot on concrete! 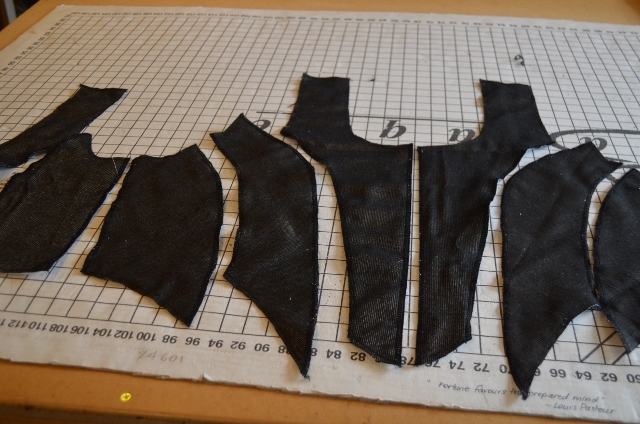 I have piped the bodice with black broadcloth. 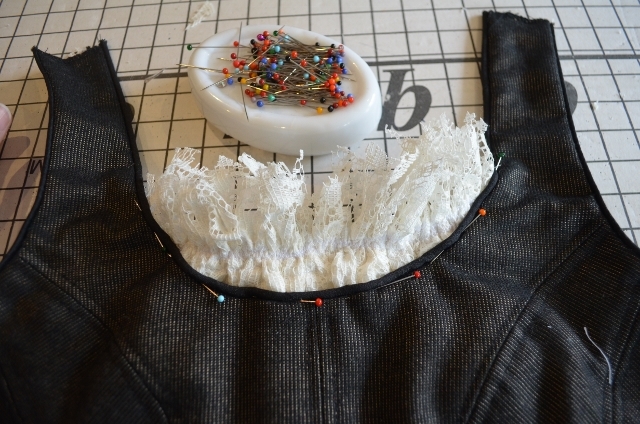 The chemise was then sewn in the ditch to the bodice. The broadcloth lent itself so well to my distressing techniques. 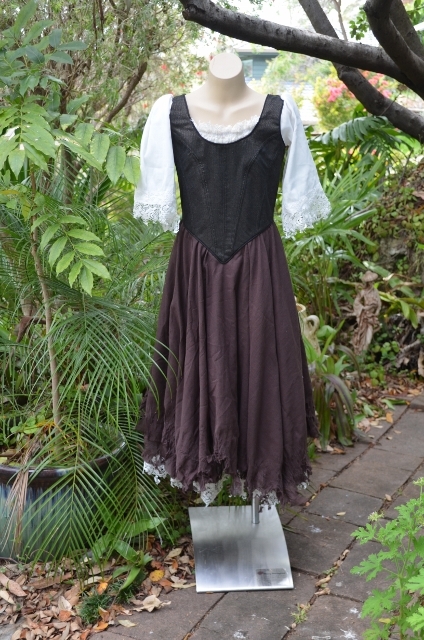 There are 2 layers of brown broadcloth mounted on a basque like a romantic tutu. 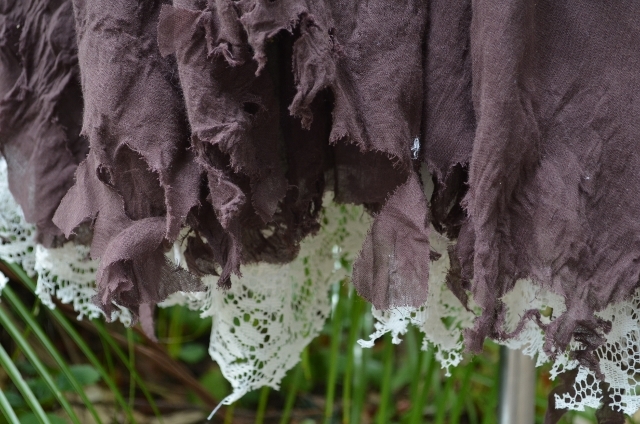 The ragged petticoat underneath adds definition to the skirt line. 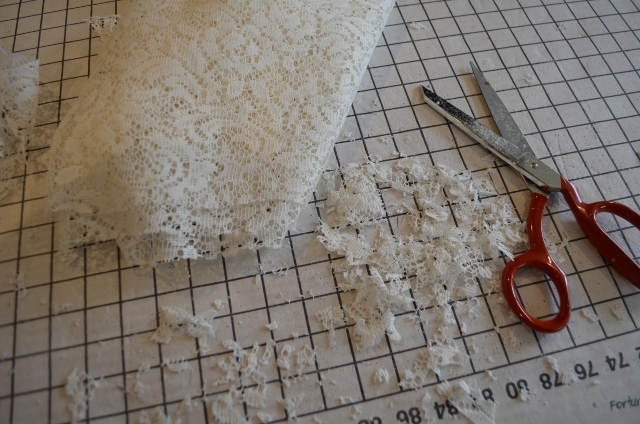 The ragged lace is mounted on a muslin petticoat and then sewn to the bottom of the basque. 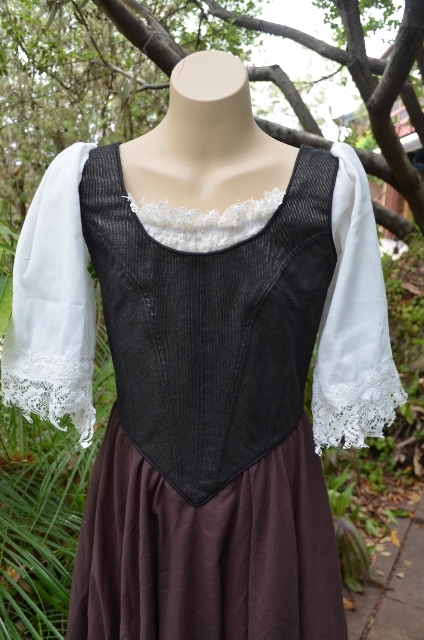 The sleeves are loose to the elbow and have the ragged lace attached. And here is the costume all put together! This costume could also work for a Cinderella or Little Match Girl demi. With a romantic skirt added and different sleeves she could even be Giselle! 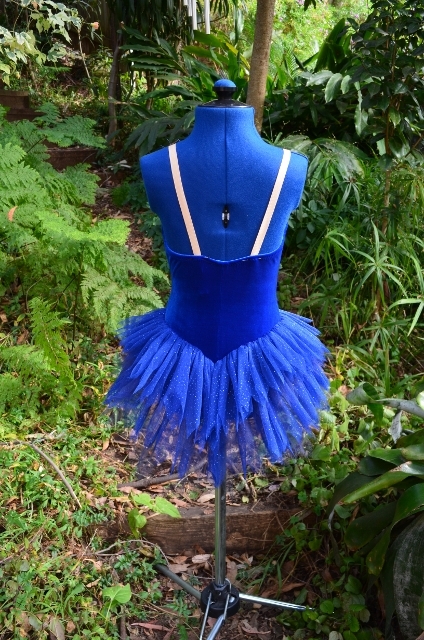 While i seem to mostly be making tutus every now and again i get to do a lyrical costume or a demi-character costume. Demi-character is a wonderful combination of ballet technique and characterisation. This can be dramatic or funny or sometimes just darn cute here’s a costume for the latter category; a little bluebird. The “character” part of this dance form is firmly embedded in the choreography and the dancer’s ability to characterise. The costume is there for support. So with that in mind we decided that this costume only needed to evoke a bird. 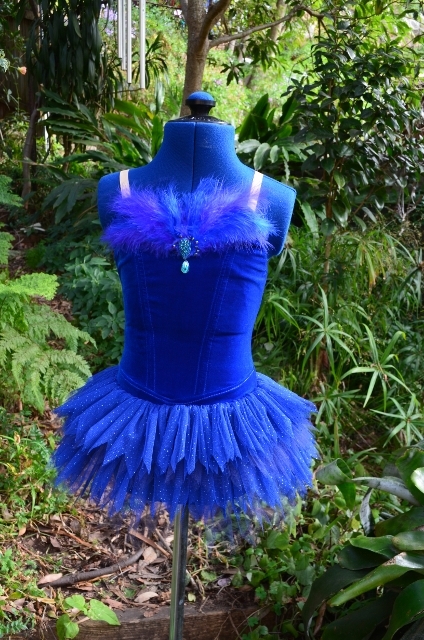 Feathers were the first idea we settled on and we thought we’d team it with a little upside down bell tutu with a bit of a tail. Here’s how we did it. 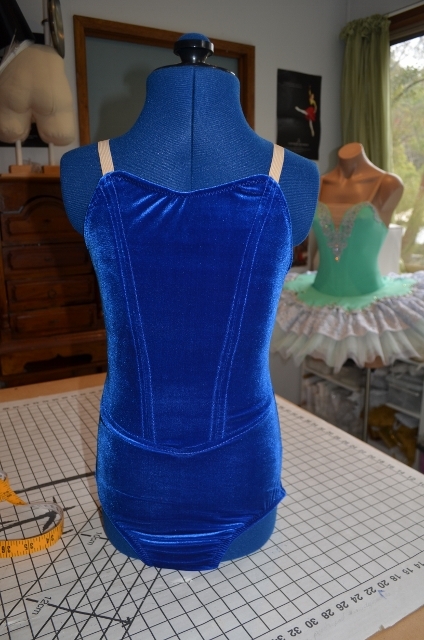 I used Dani Legge’s tutu pattern for the leotard. I thought it was cute to bring the tutu back into demi-character. This leotard has a faux basque and lovely line. 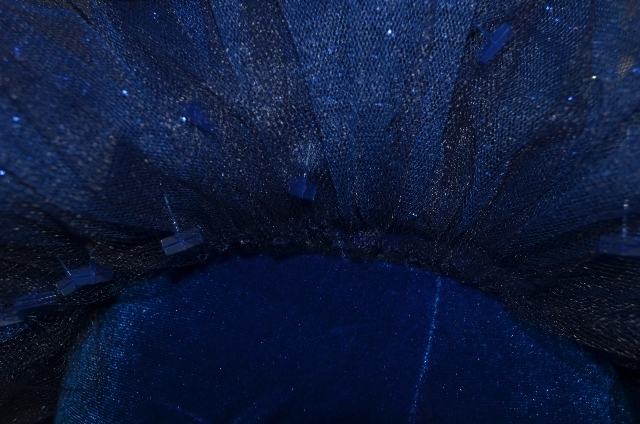 Bird tutus in classical ballet often have dagged nets (princesses have scallops!) so it made sense for this wee bird to have pointy tutu layers too. 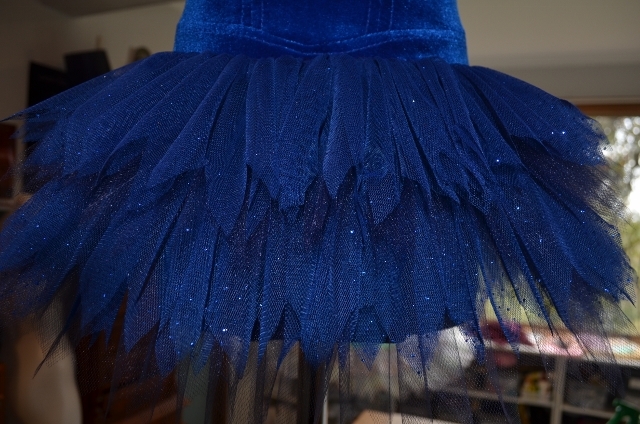 This tutu was made from sparkle tulle and bridal tulle so it’s very soft and floppy. I cut the layers longer at the back to give the idea of a bird’s tail. 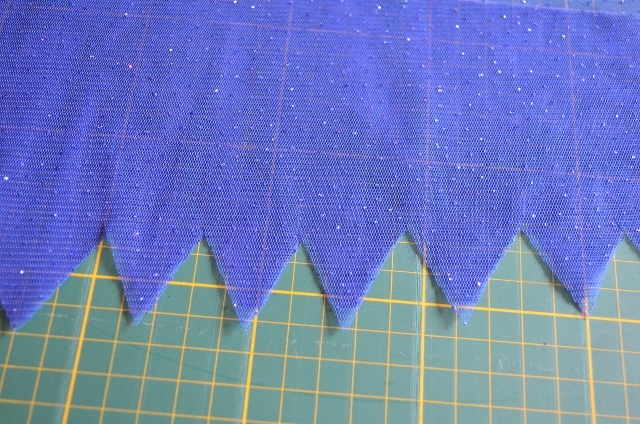 There are 4 layers of alternating sparkle and bridal tulle. Layer 1 was sewn seam allowance down and the remaining were sewn seam allowance up so the skirt would lie fairly flat. The top layer was a bit perky so i needed to tame it a bit. 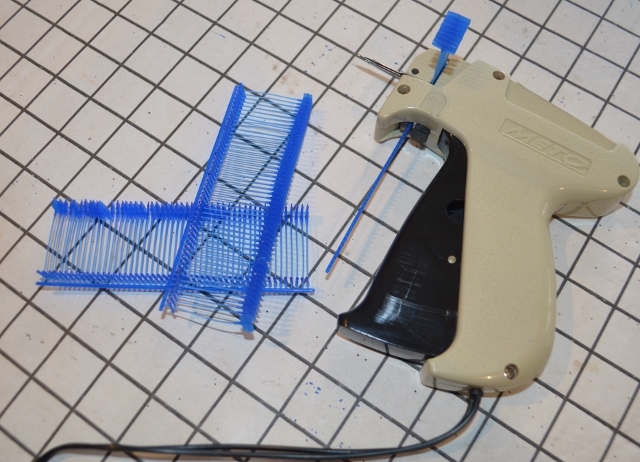 So out came my trusty tagging gun and some fantastic blue tags! I really just needed to hold the top layer down a bit so I placed tags through all layers quite close to the top of the skirt. 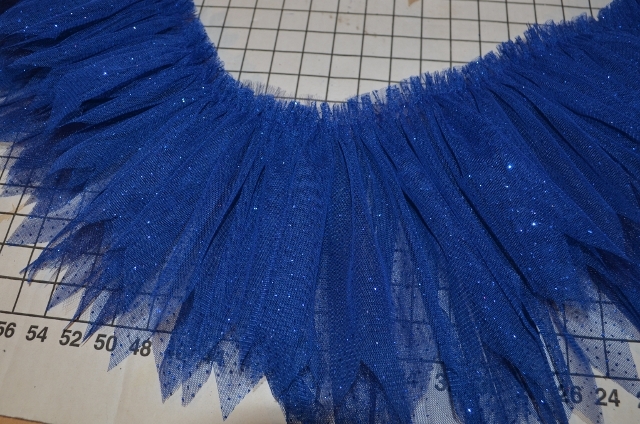 Bell tutus have light tacking as well so it’s not surprising this little one needed a bit. 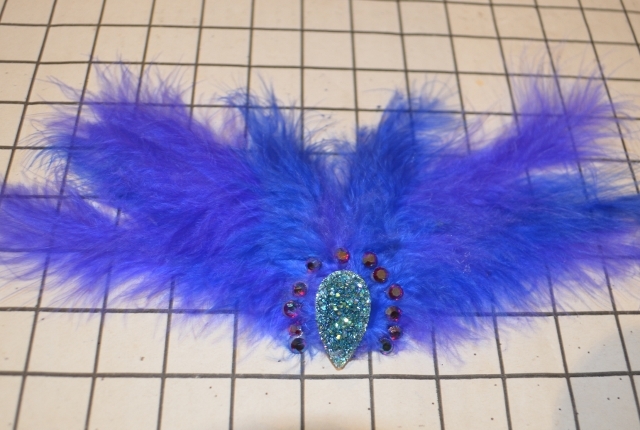 The bodice decoration had to be feathers and Roisin chose the rhinestones she wanted; lovely AB garnet Preciosa rhinestones and a gorgeous sparkly acrylic focal piece. 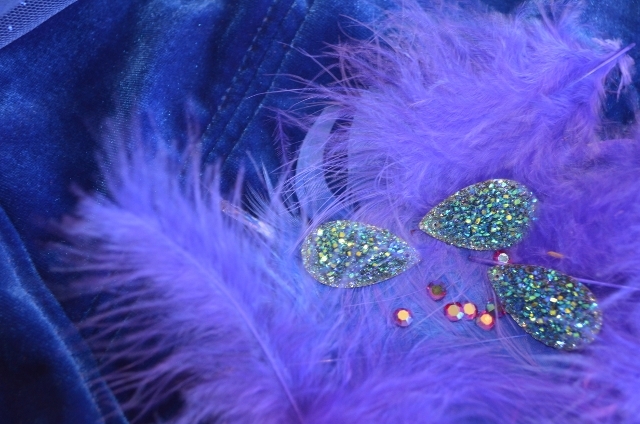 These rhinestones were repeated across other parts of the costume. The last time I’d made a feathery costume I used a glue gun. You have to work fast but a quick drying glue is the best for this so the feathers don’t just waft all over the studio. 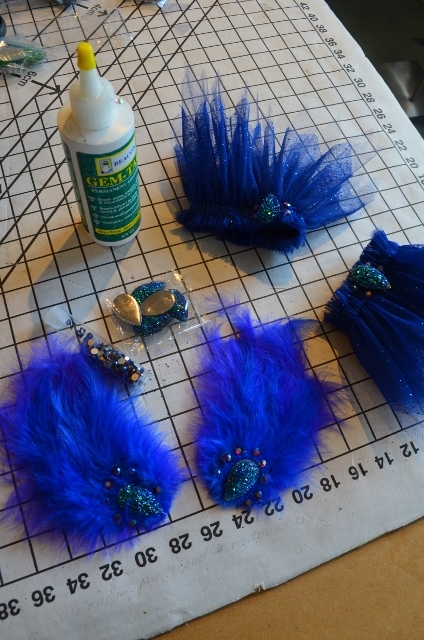 To keep the ballet theme alive with avian cliches I made some blue hackle pads as a head-dress and repeated the skirt design for the arm frills. And here is the little blue bird in all her sparkly blue glory. I dipped the tulle layers down at the back to exaggerate the bird tail.